A risk assessment at a workplace begins with an analysis of all the potential hazards. The findings from this study help in determining suitable garments that offer the correct level of protection and the best comfort. We provide personal protective workwear solutions for almost all occupations, working conditions and – not least – for all your risk assessments. Examples of hazards are thermal hazards: high convective heat, high radiant heat, flame contact, steam, molten metals and hot surfaces & electric hazards: high voltage, electric arc and static charge build-up. Below you find a few examples of hazards in different occupations and according to which certifications the protective clothing must be approved. Also more information about the different certificates and garment recommendations which meets the demands. Protection from contact with heat and flame (EN ISO 11612). Protective clothing against thermal hazards that may occur in electric arc accidents , tested according to IEC 61482-2. ATPV/EBT value of at least 8 cal/cm2 is the general guideline. If the risk is higher, we recommend you to wear several layers of certified garments or garments with higher arc-rating. Protection from contact with heat and flame (EN 11612). Protection against welding sparks (EN ISO 11611). Gaments suitable for welding have fewer pockets and functional details than other garments. Often used in conjunktion with other PPE, e.g. welding apron, helmet and gloves. Garments making the wearer visibile to their surroundings in daylight, at night and in poor weather conditions (EN ISO 20471). Some workers in this group also need garments certfied according to EN ISO 11611 for welding or similar work. Protection against sudden discharge of electrostatic energy, where there is a risk that static sparks may ignite flammable substances such as gas or oil (EN 1149-5). Conductive material sush as metal zippers or buttons must be concealed. Protection against rain and high visibility (EN 20471) are also often important for this group. Protective clothing tested according to IEC 61482-2 protects you from thermal hazards that may occur in electric arc accidents. WHO NEEDS PROTECTION AGAINST ELECTRIC ARC? Electricians, when servicing equipment in non-arc-safe distribution plants or electrical switchboards, or when working with high-voltage equipment. When there is a risk of being exposed to an electric arc, for example, when servicing equipment in non-arc-safe distribution plants or electrical switchboards, or when working on high voltage equipment, personnel are recommended to wear arc-approved protective clothing. What protection does your clothing need to provide during an arc blast? The plasma clouds, flames, radiation and metal splashes from the electrodes hit the fabric during an arc blast. When this occurs, the fabric has to provide sufficient insulation to prevent second-degree skin burns. An effective fabric used in an arc garment must provide shielding against the flame and metal splashes, as well as insulation from the intense heat. The standard IEC 61482-2 includes two test methods, EN 61482-1-1 (open arc) and EN 61482-1-2 (box test). Our garments are certified according to both test methods or one of them. The garments must cover the whole body. For example, a jacket and trousers must be worn together with other personal protective equipment (PPE), including a helmet with protective visor, protective gloves and protective footwear (boots) to achieve the correct level of protection. Layering is very important and will increase protection – if you wear flame retardant underwear underneath your flame retardant garments you are protected for even better. Protective clothing approved according to EN ISO 11612 protecting the user from contact with heat and flame. WHO NEEDS PROTECTION AGAINST HEAT AND FLAME? All our garments are certified to protect against heat and flames. For protection against molten iron and aluminium se code letter E below. Two-piece protective clothing must be worn together to provide the specified level of protection. The CE-label inside the garment states the required garment-assembly. The CE-label inside the garment states to which code letters the garment are certified. The higher level, the better. The following code letters are describing the performance of the garments. Convective heat is the heat that passes through the garment when in contact with flame. If there is an outer fabric that does not burn, injury may nevertheless occur due to the heat that forms when the fabric – and, indirectly, the body – comes into contact with the flame. Low radiant heat over a long period can result in a risk of injury. Even if the fabric does not start to burn or decay in contact with the molten metal, you can still get burns. The test indicates how many molten metal splashes the fabric can withstand before protection is compromised. Contact heat over a long period can result in risk of injury. 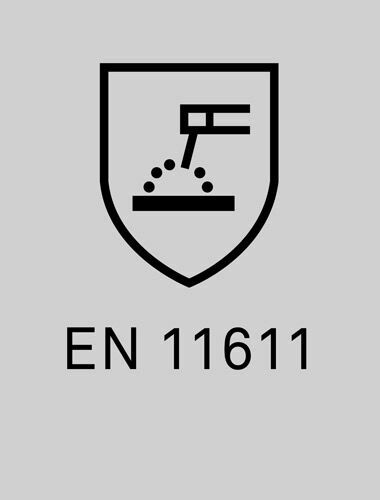 Protective clothing certified according EN ISO 11611 for use in welding or allied processes. The standard has two classes with specific protection levels. Class 1 is the lower, and class 2 the higher level. Garments for welders have fewer pockets and functional details than other garments and are often used together with welding apron, helmet and gloves. In electric arc-welding operations there is a risk of exposure of skin to Ultraviolet (UV) radiation. During use the fabric of the clothing will degrade. Examine the garments regularly to prevent exposure to UV radiation. If user experience sunburn-like symptoms, UVB is penetrating. If garment is found to be penetrated by UV radiation, it should be repaired (if practicable) or replaced and the use of additional, more resistant protective layers should be considered in future. Two-piece protective clothing must be worn together to provide the specified level of protection. The CE-label inside the garment states the required garment-assembly. Using additional partial protective garments, the basic garment shall meet at least Class 1. Use of welding apron which covers the front body at least from side seam to side seam is recommended. Additional partial body protection may be required, e.g. for welding overhead. 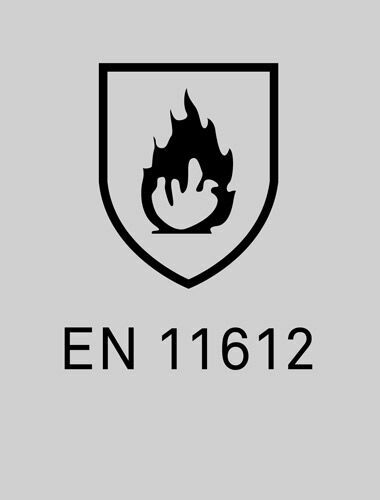 Certified and approved protective clothing against electrostatic discharge according to EN 1149-5.
WHO NEEDS PROTECTION IN EXPLOSIVE RISK ENVIRONMENTS? Static electricity, which can cause sparks. 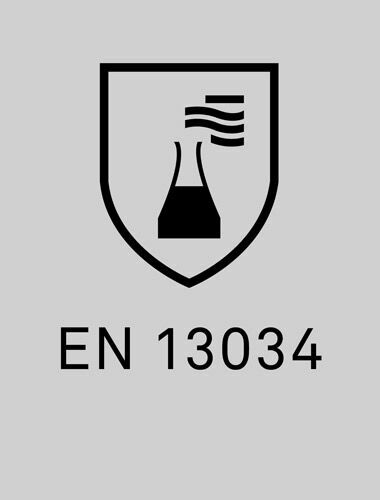 Protective clothing tested according to EN 13034 offers protection against liquid chemical splashes. WHO NEEDS PROTECTION AGAINST CHEMICAL SPLASH? Important: The standard describes clothing that has been tested for repellency to chemical splashes, not resistance to permeation of chemicals! The clothing gives protection against specific named chemicals. Please note: Adequate treatment must be added to the washing process minimum for every 5th washing cycle.